As at today,all attention on the minimum wage controversy is focused on the federal government, with little discourse about the stance of Nigerian Governors' Forum, NGF and the organized private sector. 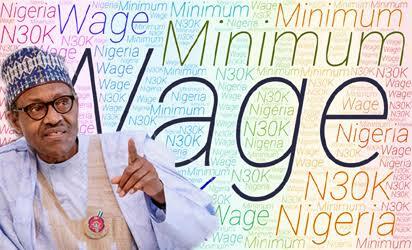 Even though media reports have been primarily based on thirty thousand naira (N30,000) as 'agreed' minimum wage, it is salient at this juncture to note that members of the tripartite committee set up to review the existing minimum wage, were divided in their recommendations. While some (seeming majority) stuck to N30, 000, other members of the tripartite committee reportedly recommended N24,000 ( perhaps they took cognisance of the position of governors of the 36 states in Nigeria under the aegis of NGF). It's instructive to point that contrary to pockets of media reports that the federal government assured of paying N30,000 immediately President Muhammadu Buhari received report of the tripartite committee, the President stated emphatically that a committee will be put together by the federal government to look into the recommendation(s) with a view to sponsoring Executive Bill to the National Assembly for onward consideration and possible return to the executive for assent, before implementation. While the Organized Labour (NLC,TUC and United Labour Congress, ULC) as well as the workforce in Nigeria may be basking in the euphoria of seeming success in their demand and ready to take on the federal government on another round of strike in the event of delay or refusal to stick to N30,000 minimum wage implementation, there are indications that affiliates of Organized Labour such as NUT and NULGE as well as state branches of NLC will go solo to press home their demand,once the next phase of labour crisis commences before the turn of the year or prior to the 2019 general elections. The postulation here is anchored on the raging arguments by majority of the state governors and even some employers in the private sector against the N30,000 minimum wage, on the ground that they are willing, but lack the capacity to pay. Already, a State like Edo has been paying N25,000 as minimum wage before Adams Oshiomhole left as governor and the current governor of the State, Mr. Godwin Obaseki has reportedly expressed willingness to pay whatever is agreed upon, even though majority of his colleagues differ. The strong possibility is that should the federal government agree to pay N30,000 if it eventually scale through the process of becoming an act and a few State governors follow suit, will the Organized Labour still declare Nationwide Industrial Action? The answer that readily comes to mind is that states and local governments as well as employers in the private sector that "can't pay" their workers N30,000 minimum wage, may have to contend with their local unions, because the Federal government and State governments that may likely implement the new minimum wage will now have the moral and legal justification to implement the "No work, No Pay Policy".